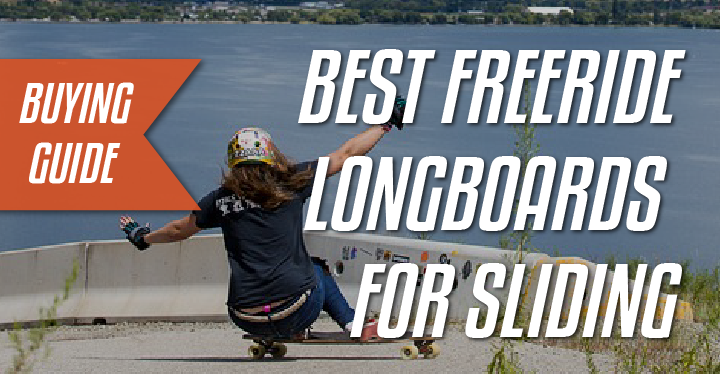 Want to throw out some awesome slides and paint the street with thick thane lines? It could be possible to do it with any board out there, though some boards are just going to be better at it than others. The last thing we all want is to do a stylish slide and end up eating the concrete. With this guide, you should be able to narrow down some options for you next drifting and thane laying machine. 2 What exactly is freeriding? 4 What to look for in a Freeride Longboard? Free riding is a particular style or discipline of skating, with more emphasis on performing different slides. It can be done at moderate, slow or fast speeds and among the most commonly done slides are stand up and glove down slides. Other commonly done slides are pre-drifts, 180’s and “pendys”. They say a picture is worth a thousand words so here’s a video of some free riding from Melbourne. See how these free riders at a local hill, showcase their various slides. So now you have some sort of an idea of what freeriding involves. However not all boards are suitable for this type of riding. For a good free riding experience you want to choose boards that have the right characteristics. Lots of boards that are suitable for free riding also make good downhill boards. So let’s look at a few decks that have those characteristics to give you an idea. This Santa Cruz features a 9ply maple deck construction. 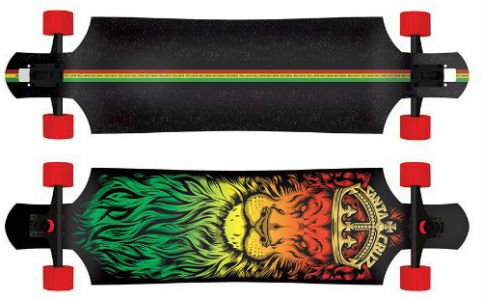 It has an optimal size for a freeride deck – 40 inches in length and 10 in width. The board is a drop down deck and has a drop through mounting system for the trucks. Providing a lower center of gravity and therefore making those slides easier to kick out and more stable. For the price point, the board has a decent set-up – Road Rider 180 trucks and OJ Thunder Juice 75mm/78a wheels. Low-end price: The board is reasonably priced and therefore good for beginners. Since you are most likely going to send it into the curb a few times when learning your first slides. 9 ply maple construction: The maple design, whilst sturdy will be more likely be prone to denting and chipping compared to other materials. Not to mention the 9 ply maple construction makes this one on the heavy side. The sector 9 dropper features a 9 pile cold pressed maple construction, providing stability and somewhat decent durability. It is 41 in length and 10”in width, making it ideal for those preferring large foot platforms. The large length will make this board more stable. The board also has features such as a “0.625” inch drop rocker, shocker mold, drop through mount for the trucks, and a “29.0” wheelbase. It comes with a pretty good set-up – 10-inch Gullwing Charger trucks and the “famous” butterball wheels. The drop through mount design and rocker helps it easier to push out slides and stay locked in, due to a lower center of gravity. 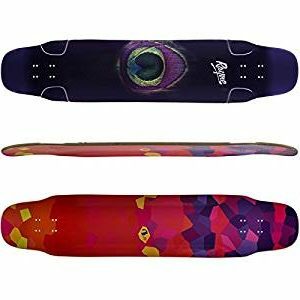 Value: The board provides good value, as for its relatively low price it comes with aftermarket wheels that are great for freeriding. The butterballs have rounded lips, and a narrow contact patch. Making them great for sliding! Plus they dump massive white thane lines! Leaving your mark on the tarmac. Here is a video showing off the “butterballs” in action. Just look at those urethane lines..
Lookout might be one of the most well-known Sector 9 boards. It features a vertically laminated bamboo construction. Including “taco mold”, and a drop through mount system. The board is 41.125 in length and 9.625 in width, making it longer than most freeride boards. The wheelbase is 31 in which really helps with the stability. Bamboo construction: The bamboo construction makes it a durable but lightweight board. Great for commuting and carrying up one of your local hills. This also means it’s agile, and lively to the riders input. Wheel cut outs: Wheel cut outs a good feature as they provide clearance for larger wheels and help avoid wheel bite. Relatively flat concave: There is somewhat lack of concave so it may not lock your feet in so well. Making it somewhat unsuitable for high speed free riding. Square lipped wheels: The square lipped wheels will make it harder to push out slides and are more suitable for carving and gripping. I’d suggest something more like “Butterballs”, “Premier Aces”. As long as the wheels have round lips they should do nicely. Arbor AXIS 40 features a Carbonized bamboo deck construction. With wheel cut outs, concave, lucid grip tape, drop through mounting system and Si outlook 70mm, 7Ba wheels. The length of the deck is 36 in and width is 10 in making it long enough for great stability, but short enough to kick out slides. The board also comes with really good set of 50 degree 180mm Paris trucks. The carbonized bamboo deck provides an agile, responsive ride. As well as being durable and not prone to waterlogging. The length of the deck means it will be more responsive to the riders(your) input. The 50-degree trucks provide a nice balance between turning ability and stability. Paris trucks: The trucks are a great option for free riding and carving. As they provide good turning ability and responsiveness with its 50-degree baseplate. The 180mm provides decent stability. Somewhat slow bearings: The bearings are only “ABEC-5” rated. I’d recommend some “Bones Reds”. Landyachtz Switch 40, a dropped platform that features a Canadian maple and fiberglass construction. Being drop platform, 40in length (obviously), and 32in wheels base, this board will provide better sliding capabilities, than some of the other boards in this review. As well as, the combination of a maple and fiberglass construction provides a durable, light and stable platform. Dropped platform: Provides great stability and easier to initiate slides. Top mount: The decision to combine the dropped platform with a top mount design is a great idea for beginner or intermediate riders. It provides stability whilst combining the advantages of a top mount. Such as more leverage over the trucks, therefore better grip and control. Symmetrical shape: Provides more leverage for riding switch and possible trick combinations! Socially responsible product: Landyachtz has a program called “One board, One tree”. Supporting the natural environment – with planting a tree for every board they sell. 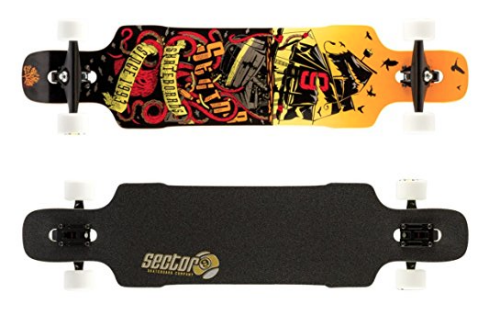 What to look for in a Freeride Longboard? Ok since we have already looked at various boards, let’s look at some of the features that help make a freeride deck a “freeride” deck. Symmetrical shapes: When it comes to freeriding, symmetrical shapes will work best. As these decks shapes will help provide you the ability to ride the board two ways and switch when performing 180s. Providing a good amount of flexibility. Drop-through mounts: The drop through mounting helps provide more stability as well as making it easier to push out slides and break traction. Therefore making it easier to perform slides. Drop through decks can also be top mounted. Providing flexibility if you want some more grip and responsiveness. Drop platform: Drop decks help make great freeride decks as well. The even lower platform helps provide additional stability and top mounted trucks provide grip, control, and a lively ride. Whilst also helping breaking traction easier and pushing out slides. Low amount of flex: Flex refers to how bouncy, and flexible a longboard is. Ideally, you will want a stiff board with no or little flex. Stiff boards are easier to slide and control better at faster speeds. Good amount of Concave: Concave refers to the curvature of the board’s deck. Ideally, you will want a board with moderate or high amount of concave that locks in your feet. This will help you stay on top of your board, having more control and feel more comfortable whilst freeriding. Hence providing a “locked in feeling “It would be difficult to free ride a flat board with no concave as your feet would be more prone to slipping around whilst performing slides. Rocker: Rocker is a great feature to have on freeride decks. Rocker is essentially where the board bends down slightly in an arc. Therefore the center of the board is below the trucks. Providing an easier push, whilst creating stability and easier slide initiation. Wheelbase and deck length: Wheelbases refer to the distance between the trucks on a longboard. The larger the wheelbase the more stable but less responsive. The shorter the wheelbase the less stable. But more lively, agile and responsive the ride is. 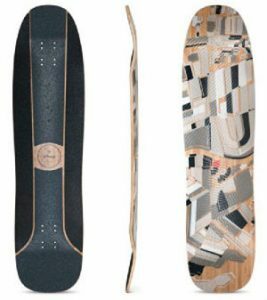 For freeride decks, you would ideally choose something between “28” to “32”. Deck lengths and widths: For deck lengths, you should go for something that is anywhere between “38”-42” inches in length. Providing a good balance between stability and responsiveness, whilst not being too bulky either. Most deck widths are correlated with deck lengths so there isn’t much of a need to worry about the width. Most decks come with a width between “9 to 10”. 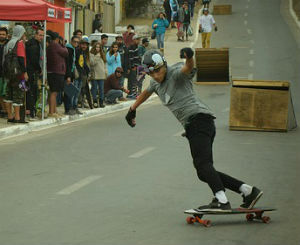 Hopefully, you now have an idea of what to look for, when it comes to freeriding longboards. A good thing to remember is, to try different set ups and experiment. As this is just a rough guide and your taste and preferences will change with experience and skill.